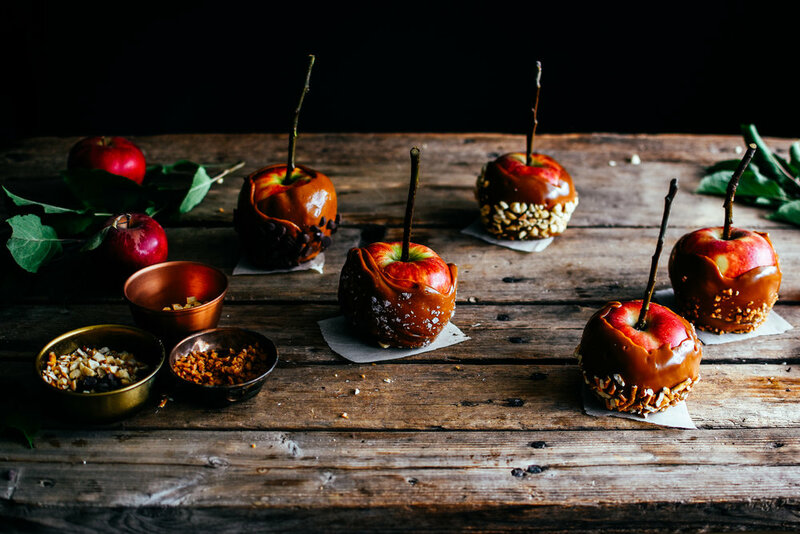 If you've been following along for a looooooong time, then you may know that I've shared this recipe for caramel apples before! It's been years and years (and back when I blogged at "p.s.heart"), and I wanted to update the photos since they're one of my very favourite Fall treats. This recipe is from Sprinkle Bakes, who was one of the first bloggers I ever followed, and she was such a huge influence on my decision to start a blog myself almost 8 years ago! This caramel is so beautiful, shiny, and delicious, and perfect to make for a Fall party! Use tart apples! The tartness works so well with the sweet caramel, and you don't want it to be all overly sweet! Have everything laid out and ready to go before you start cooking your caramel. That means: parchment on a baking sheet. Apples washed and dried and sticks skewered in already. *must have a candy thermometer for this recipe! pretzels, chocolate chips, nuts, flaked salt, toffee bits, sprinkles, etc. 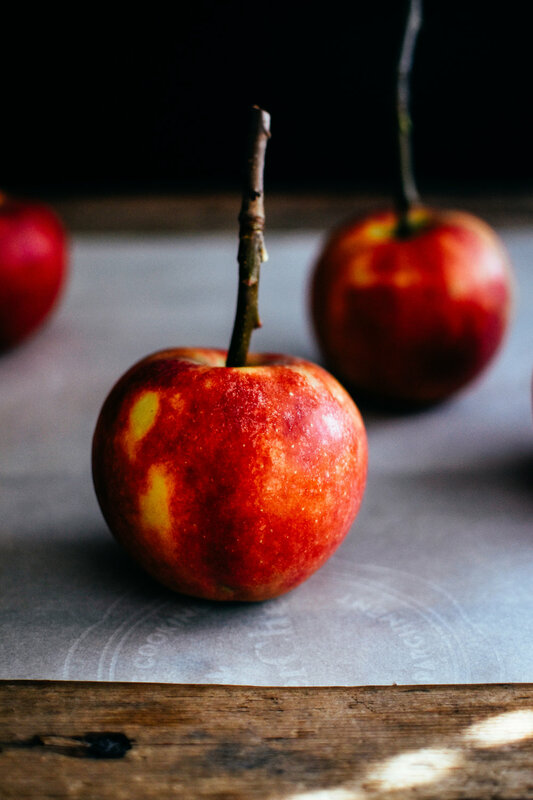 1) First, place a large sheet of parchment or a silicone mat on a work surface that will be able to hold all of your apples without them touching each other. Set aside. 2) Wash and dry your apples (the caramel won't stick if they're wet at all!) - this is especially important if your apples are waxed. Remove the apple stems, and punch a guide hole for your stick using a metal skewer or skinny knife. Insert stick into each apple, and make sure it's secure. 4) In a medium, thick-bottomed pot, combine corn syrup, brown sugar, and white sugar. Bring to a simmer while stirring, over a high heat. When the mixture boils, add the butter. Stir until the butter is melted, and reduce the heat to medium-high. 5) Add milk/cream mixture in a small steady stream, whisking continually. You want the caramel to keep boiling slightly. 7) Bring to 250 degrees F while whisking to keep from burning. This will take approximately 15 minutes or so. So be patient! Careful that it doesn't rise above 250 as your caramel will get too hard quickly! [Optional]: Immediately after dipping, roll your apple in a topping: chopped nuts, chocolate, skor bits, coconut, etc.